The Tokyo Motor Show has become the grandest of them all with all top automakers heading to the event to showcase their best cars. Toyota Century luxury limo is yet another model heading to the expo. Instead of waiting for the auto expo to commence, the automobile manufacturer has revealed the specifications and other interesting details about the Limo much earlier. It’s the third version of their flagship car which runs on petrol and is being targeted towards the Eastern market. The car may not get launched in the UK or Europe. The details are not confirmed at the moment which we opine may get announced during the event. The Toyota Century has set a benchmark with their extremely powerful V-configuration engine and being a limousine, it obviously stands tall when it comes to offering the best in-class comfort. 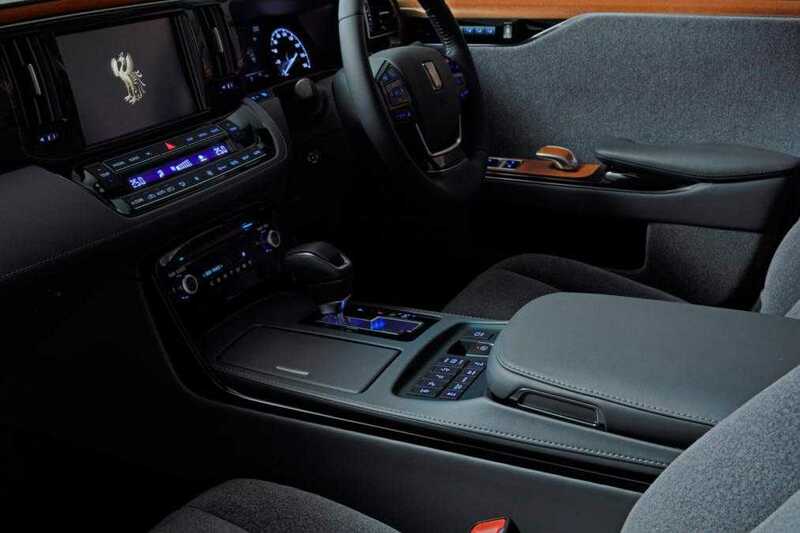 Passengers inside the vehicle could relax with amazing legroom, pillows neatly stacked on the seats and enjoy a ride without any jerky motions because of the high-powered engine that drives this limo. It is expected that Toyota has integrated a 5.0-liter V8 engine to power this beast. Instead of going with the conventional petrol-only engine, the model has been upgraded with a hybrid technology which pairs the petrol engine with an electric motor. It contributes to a greener environment and makes the car more fuel efficient as it automatically switches to battery power whenever possible. The luxury of the flagship model can be witnessed in the interiors which features a large LCD panel to configure multiple features in the car. For an immersive aural experience, 20 different speakers are placed on all corners of the limousine. A LCD panel has been provided on the passenger end so that those in the rear seat can adjust AC settings, audio without disturbing the driver. Massaging seats relax passengers on the go, the top is covered with 100% wool material and reading lights are mounted on the sides for easy business meetings. The Toyota Century flagship limousine has been designed from the ground up to be a business for pleasure model where both professional and casual tasks can be done with relative ease. The closest rivals are the Mercedes S-Class, BMW 7 series yet the level of luxury provided by this particular model is unparalleled by any of these variants, according to Toyota. The pricing of the Century is still kept under wraps. Availability and other features are expected to be unveiled at the Tokyo Motor Show this month. Next Next post: Google Pixel 2 XL has a slight battery life bump and a bigger screen than the Pixel 2 – Are these worth the extra $200?